Twistor, Wm. Morrow & Co., Inc., (1989) hardcover 1st edition, 416p., ISBN: 0-87795-967-6; Original list price $18.95. Here's the first chapter of Twistor, as provided by Avon. Twistor was my first novel. Writing it resulted in a nomination for the Compton Crook Award (Best 1st Novel, 1990) and in two nominations (1990 and 1991) for the John W. Campbell Award (Best New Writer). It was also on the semi-final ballot for the 1991 Nebula Awards. Twistor was written to fill a need I perceived in the SF market for good "hard SF" written by scientists about the business of doing science. It was edited by David G. Hartwell and published in hardcover by Morrow in 1989. It was also available in hardcover from the Science Fiction Book Club. It was published in paperback in 1991 by AvoNova (Avon) in the USA and by NEL (New English Library) in the UK. A Japanese Edition (Hyakawa - 1996) has just been published under the title The Shadow of Gravity.. In the USA Twistor has just (5/97) been reprinted by Avon in a new and slightly revised eddition, along with my new hard SF novel Einstein's Bridge. This is the Twistor book jacket from the original Morrow hardcover edition (1989). The cover painting was done by Bob Eggleton. 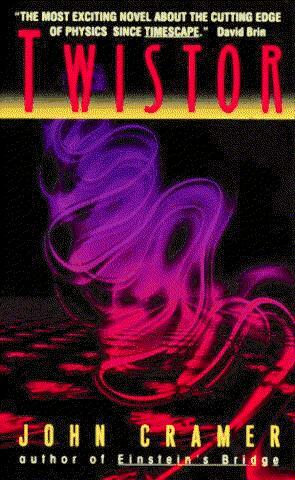 This is the new Twistor book cover used on the Avon paperback edition (1997). Science fiction at its best is about how much fun it is to do real science, to experience the excitement of scientific ideas, and to use them to build wonderful new devices that do new things, that transform our lives. This kind of science fiction is called "hard SF" by the fans, the hard stuff that is the finest pleasure of the connoisseur. Twistor is hard SF. 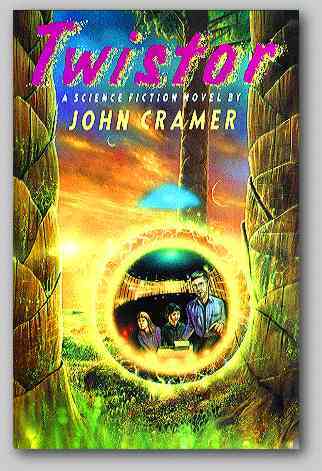 Twistor is a first novel by John Cramer, who is known to SF readership for his "Alternate View" columns in Analog magazine. He brings the knowledge of the grit and detail of the everyday life of the working scientist to the story of David Harrison, the young physicist who discovers the twistor effect, an astounding breakthrough in experimental physics that puts alternate physical universes within reach of human exploration. The plot thickens when some hired thugs are sent by a corporate espionage agent to steal David's experimental device. As David is about to send the whole shebang, including a big chunk of his lab, into another universe and out of reach of the thieves, he finds the two young children of one of his colleagues have hidden in his lab to surprise him. In a split second, David decides, and he and the children pass together through the twistor field into another world, leaving the bewildered thugs behind. Stranded on another Earth not quite like ours, David must use his basic knowledge to become a Robinson Crusoe in this new place, to save himself and the children, and to find a way back home. The forefront of science fiction is the scientific speculation found in hard SF. Twistor is based on real physics, provicative and even startling. Such writers as Larry Niven, David Brin, Gregory Benford, and James P. Hogan have made their reputations writing this kind of fiction. Add Cramer's name to that list. Twistor is essential SF. John Cramer lives in Seattle, Washington, where he is professor of physics at the University of Washington. He plans a sequel to Twistor. "This book originates, then, not only from a scientist well up in his profession but also from deeply felt and thoroughly incorporated SF traditions. Twistor ... is as handsome and well-formed a work of its kind as one could ask for ... The sense of rigor derives from Cramer's ingenuity in finding unexpected and charming ways to show us the shadow universe in which the bulk of the extraterrestrial action occurs, and in it things captivatingly like-but-unlike things in our world ... captivatingly better ... If there is a 'hard-science' genre, John Cramer has excellently filled our needs in that respect, and one looks forward to a sequel. This book is what SCIENCE fiction is demonstrably all about. The rest of what is done in SF has more to do with the fiction." This page was created by John G. Cramer on 7/10/96 and updated 6/23/97.